Listed below are a few known issues and caveats in Printer's Apprentice 8.1. These issues do not detract from using the software. But it is a good idea to be aware of them. Please contact us with any questions. Microsoft .NET 2.0 Framework is required - Printer's Apprentice has been developed with the Microsoft .NET 2.0 Framework. We recommend downloading and installing the framework before installing Printer's Apprentice. Administrator account required for Windows 10, 8 & 7 - Font management functions in Printer's Apprentice manipulate files in the %windir%\fonts folder and Registry entries. 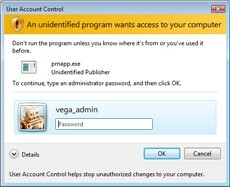 The User Access Control feature in Windows restricts application access to these areas and requires an Administrator level password. 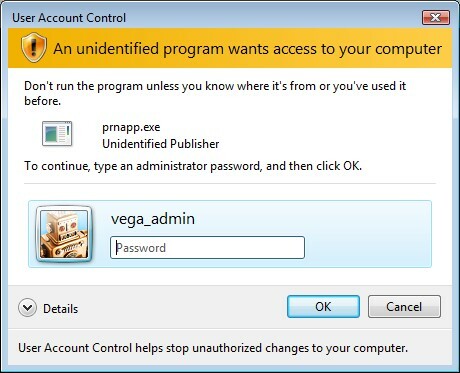 The Printer's Apprentice icon is marked with a shield and you will be prompted for a password when it is run. We looked at a couple of different ways to access the %windir%\fonts folder and Registry. But concluded that prompting for an Administrator password	was actually the least invasive solution. 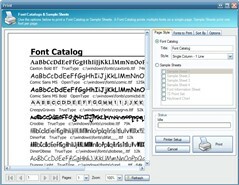 Postscript support - At this time, Printer's Apprentice view cannot print samples of Adobe Type 1 fonts. This is due to lack of Postscript support in Microsoft's GDI+ libraries. We are working on a fix for this. 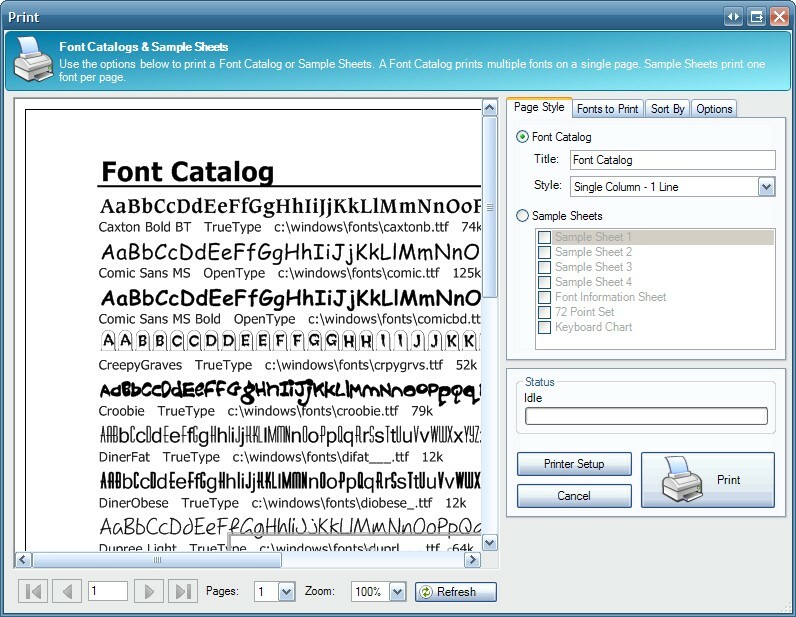 The following chart outlines font format support in Printer's Apprentice 8.1. As of Printer's Apprentice 8.0.29, released in March 2009, Postscript printing is supported! Print Preview window is not accurate on Windows XP - There is a bug in the Windows GDI+ library that prevents uninstalled TrueType fonts from rendering correctly in the Print Preview dialog box. The Print Preview window draws correctly under Windows Vista. Microsoft has the information, but the bug has not been fixed under Windows XP. 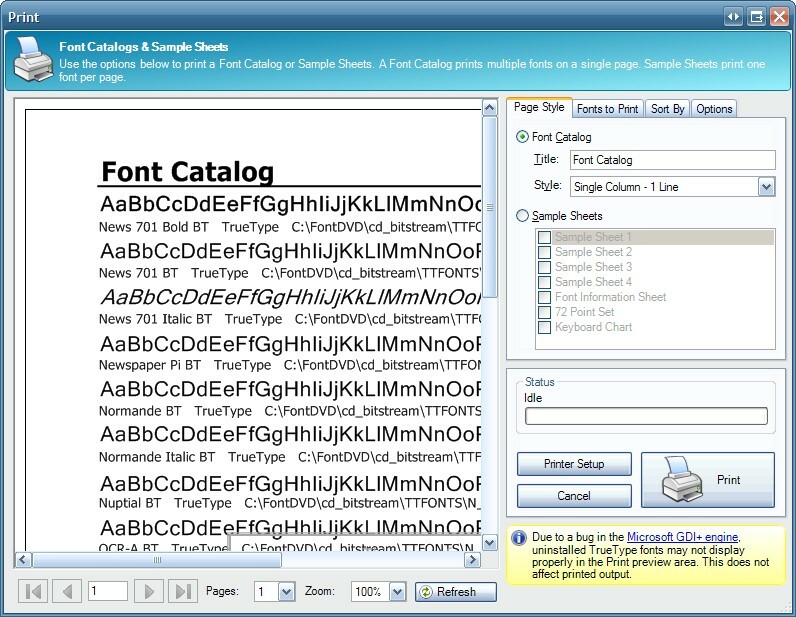 The printed output is not affected and uninstalled TrueType fonts are drawn correctly. You can see an example of the problem in the screen shots below.